A dental implant is an artificial tooth root usually made of surgical-grade titanium. This is the most modern and closest replacement for natural tooth. 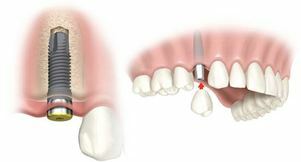 This small screw-like device is placed in the bone of the upper or lower jaw. After the bone has grown around the implant, implants can hold a crown, bridge or overdenture just like roots hold natural teeth in place. Under proper conditions these restorations are virtually indistinguishable from natural teeth. The implant stimulates no foreign body reaction in the patient and the bone bonds to its surface. Dental implants are extremely cost effective as they have a 98% success rate, In addition, implants can help preserve shape of the face, preventing the bone deterioration that occurs when teeth are missing. If you are having only one tooth replaced, only one implant will be placed but for replacing all teeth in one jaw 5 or 6 implants are normally enough. Overdentures can be held in place with as few as 2 implants in some cases. 1. A hole is prepared in the jaw bone in stages. 4. When the gum is formed (1 week) an abutment is inserted. 5. A crown is then fitted to the abutment. Temporary restorations can be made between the steps for cosmetic purposes. Most healthy individuals that maintain a good oral hygiene program are suitable candidates for dental implants. The treatment is so low-risk that implants can be placed in patients aged 70, 80 or even 90 years provided that they have a sufficient quantity and quality of bone tissue available There is no upper age limit. Surgery is made in local anesthetic so you will not feel any pain at the time, but you may feel some discomfort during the week following the surgery and swelling is also possible. We supply painkillers post operatively. As the result you will be able to smile, chew, speak again with comfort and confidence. It is essential that you continue to see your own dentist and your hygienist for regular check-ups. Clinical studies have shown that a yearly review with your implantologist is best for the longevity of your implants. Some patients need more detailed maintenance; this will be explained prior the commencement of your treatment. With appropriate care implants can last a lifetime. Please, tell us about your problem! Do you have missing teeth, but your case can’t be solved with any of the usual/ordinary/regular restorations? You have been planning an implant surgery so you want to know everything about this treatment? Check out our new FAQ implant article, click here!